Stock Status: We're sorry, this item has been discontinued and is no longer available. 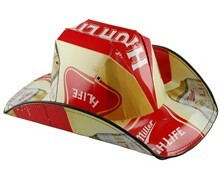 The newest and most realistic Stetson style beer hat yet! 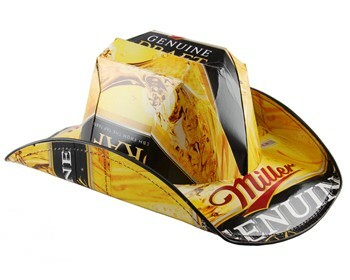 You no longer have to wear some regular styled beer cowboy hat. 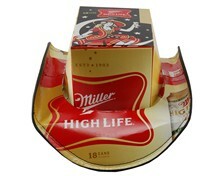 The new Stetson style beer cowboy hat shows that you've got some serious style and are not afraid to show it. This hat was designed to look just like a real cowboy hat, not just a box with a brim. Like our other beer hats, these are great for wearing to the game, the track, the bar, concerts, parties and more, these Beer Hats are sure to make a real statement. 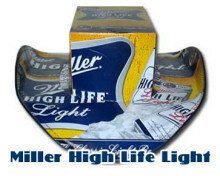 Made from real Miller Genuine Draft beer cases, these unique hats are professionally cut, assembled, and machine sewn... there is no mistaking these for anything home-made. The hats are one-size-fits-all and have an elastic band sewn on the inside that accommodates a wide variety of head sizes as well as makes them comfortable to wear. Made from new beer cases, the cardboard is coated with urethane or plastic to increase the strength. The hat will protect you from the elements, but don't swim in it... it's not meant to be soaked! (You can imagine if wet beer cans can typically be stored and carried inside, these hats can take a reasonable amount of wear and tear, rain, abuse etc.) These make a great gift for any cowboy fan! Produced by the finest cardboard beer hat milliner (hat maker) in the country. Oh, and that country we're talking about is the good old USA. 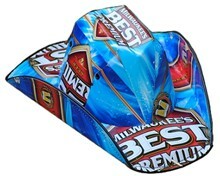 Be sure to check out our full selection of beer hats. Copyright © 2008-2019 Wingra Direct LLC.